Your answer may be in Newburgh. Specifically at 321 Liberty Street. It’s a property that isn’t going to be listed for long. It’s going Off Market for the winter. Unlike a snowbird, it’s going to sit there until someone chirps up in the spring. Liberty Street is a pretty happening street in Newburgh. Just follow the blog Newburgh Restoration and you’ll see. Well, parts of Liberty that is. And 321 Liberty is north of this area, but close enough to be connected soon as new businesses set up shop on Liberty Street. New businesses south of it include the cafe Blacc Vanilla and Cafe Macchiato (has changed hands a few times over the years and has a new dinner menu! ), and the new bakery Newburgh Flour Shop (beware of their Instagram, you may drive over the bridge just for one pecan pie). Then there’s the Shred Foundation in Newburgh (working to introduce the youth in local rural and urban areas to snowboarding). If you’re curious about owning and renovating buildings in Newburgh, talk to some of the current-day pioneers. 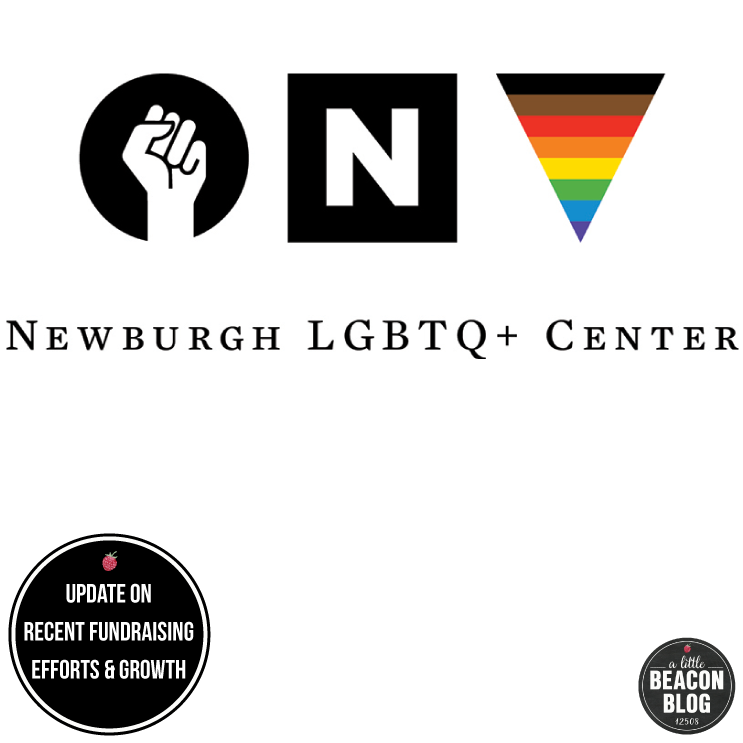 Go into Newburgh Brewery and ask them all about it, and their involvement with the larger Newburgh community. Dine at Ms. Fairfax and ask for Phillip and Ellen. They can tell you about commercial and residential renovations, and their views on where the different neighborhoods are headed. Newburgh is very diverse with people, buildings, empty buildings, renovated buildings, abandoned buildings, beautiful homes, beautifully decaying homes, and beautifully renovated homes. It’s quite a canvas over there. And this building probably needs work. 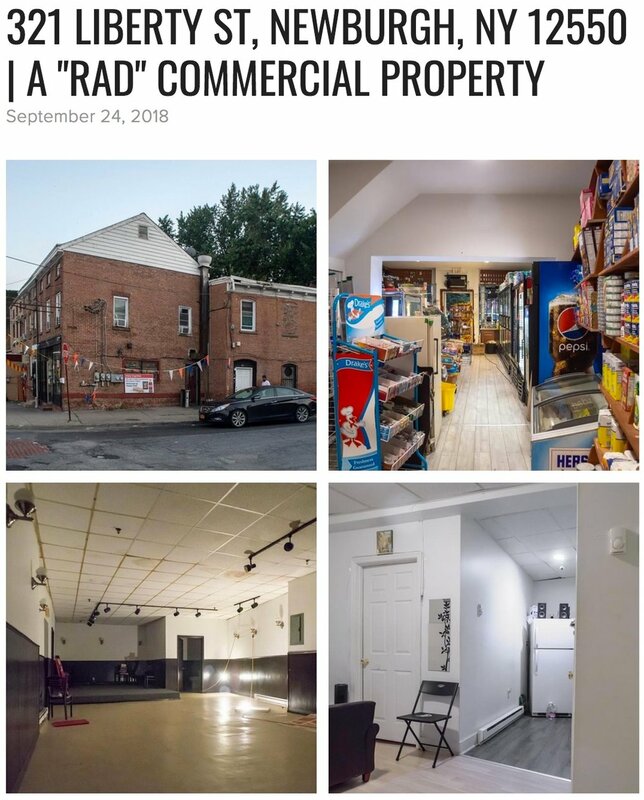 The agent for this listing, Sarah Beckham Hooff, is up to her elbows in Newburgh, having renovated a building herself, which is what got her hooked on real estate and being involved in the community. She is a wealth of information for what is going on now, and can point you in the right direction for getting to know Newburgh better. Plus, this building at 321 Liberty Street is in a newly established area, granting tax breaks for capital gains, called an Opportunity Zone (learn more about that here). This is your chance to participate in the revitalization of a once-thriving area of the country, centuries ago when it was Washington’s headquarters during the Revolutionary War, as well as a shipping resource, before urban changes routed traffic out of there, leaving it to spiral downward. But it’s on a climb back up. Refresh or start your Newburgh history here. 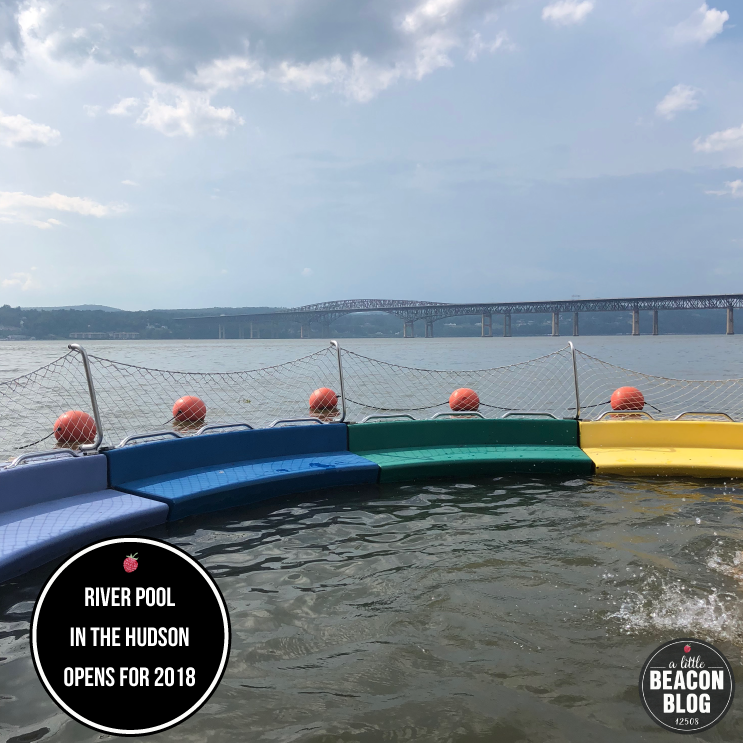 Many thanks to ReAttached Team at Hanson Real Estate Partners, who have joined A Little Beacon Blog's Real Estate Guide as sponsors to show you a selection of their retail and commercial properties in Newburgh. 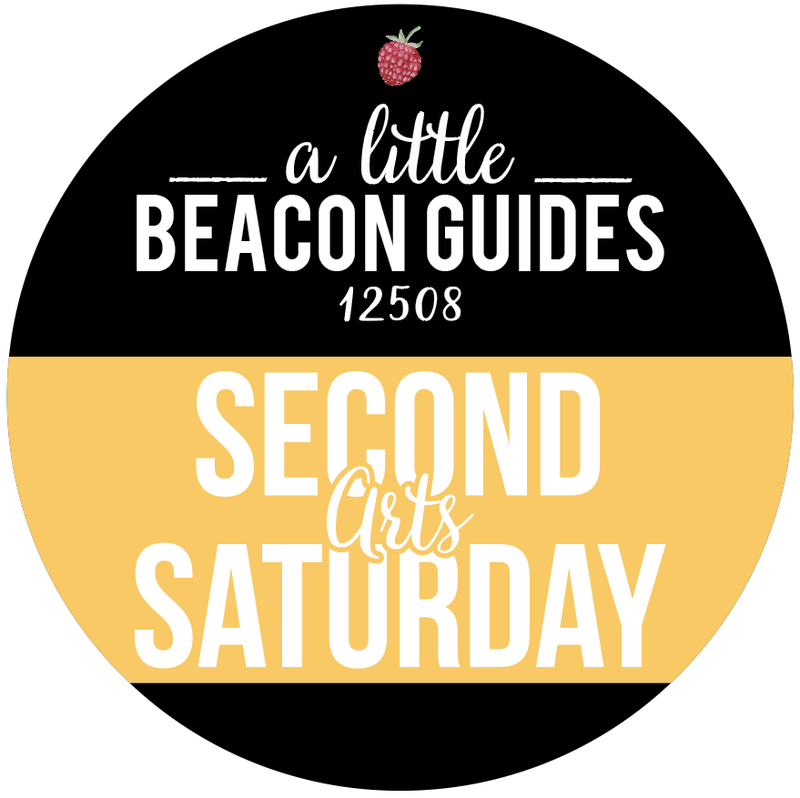 If you were at Newburgh OPEN Studios this month, you may have experienced the buzzing energy over there - and gotten a creative itch to dig in. There's even a home for sale - a "TLC Heartthrob" on Beacon Street - in Newburgh! Check them out! The ReAttached Team at Hanson Real Estate Partners invests in America’s livable urban spaces. 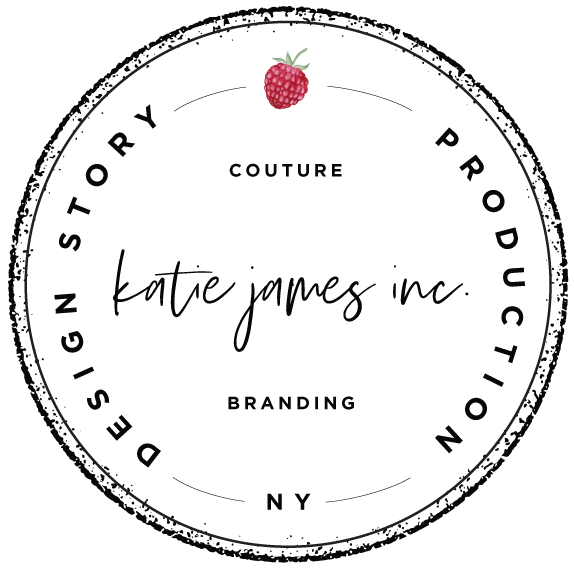 They help creative and motivated individuals define their ideal lifestyle, and understand how owning or leasing real estate in Newburgh, New York, can accelerate people’s personal, professional and financial growth. See all of the ReAttached listings and call them for tours! Sarah Beckham Hooff founded the ReAttached Team at Hanson Real Estate Partners after living abroad for 10-plus years, working as an environmental scientist, grant writer, social activist and performer. Three weeks after she discovered Newburgh, NY, she packed up and relocated. Shortly after landing, she founded a performance and recording studio in what was then an abandoned hair salon. Inspired by other creatives’ interest in rediscovering and reinventing “downtown" American living, she founded a trilingual (Spanish, Russian, English) real estate sales team to support creative investors who think like homeowners, and motivated homeowners who think like investors. In 2018, Laura Suárez joined the Team as a licensed real estate agent, to facilitate transactions with Spanish-speaking clients. Our first listing in Newburgh! Realtor Sarah Beckham Hooff reached out to us to share some very creative listings. For the past few years, people and businesses have been relocating to Newburgh after finding commercial or residential properties to fix up. This multi-or-single family home is $159,900 and has lots of original detail to play with, like tin ceilings. The fire in this picture is on 9D, near Stony Kill Farm. A transformer exploded on the road. Photo Credit: A Little Beacon Blog - photos taken from various sources, noted below. Turns out that a sick day, with three kids in quarantine after a diagnosis of strep throat, was a blessing in disguise. A major storm hit Beacon (and the Hudson Highlands, NYC, CT, PA, and NJ) at around 4 pm on Tuesday, May 15. Weather watchers were expecting rain, but when warnings of hail and high winds came across the TV, severe-weather veterans took to their yards to bring in potted plants and lower the basketball hoops. My neighbor is such a veteran weather watcher that he warned me of imminent hail before I embarked on a family walk to Key Food to fill up the fridge after my little ones ate through everything. An hour after returning, my phone vibrated its insistent SOS call, which we usually only hear for Amber Alerts. Only this time, it said "Tornado in your area. Take shelter." "This was the storm rolling in! 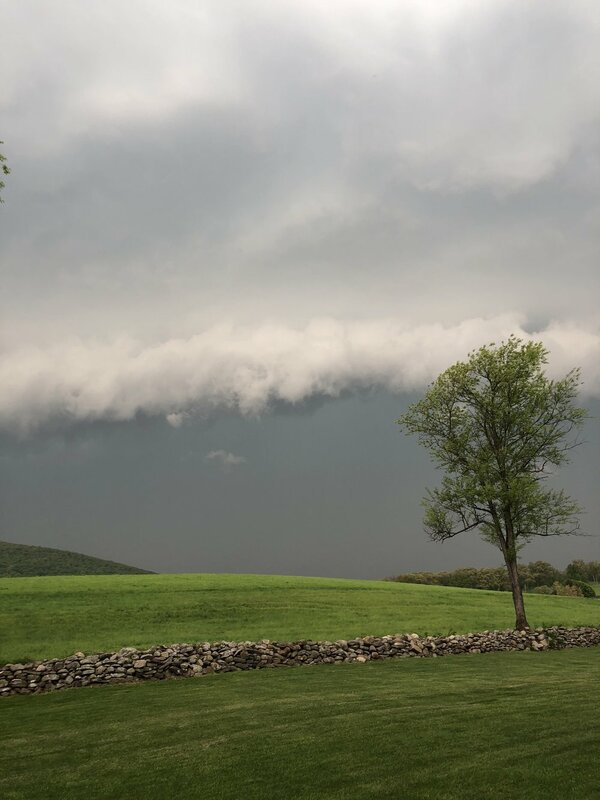 Hudson Valley Weather called this photo a gust front!" I gathered my brood, and we went straight to the basement. Thank goodness that for Mother's Day I treated myself to a bunch of new flashlights and lanterns. After a brief power outage from our winter blizzards, I realized I had no working flashlights anymore. Normally at this time of day, my husband would be working in New York City, but on Tuesday, he was headed home early (he'd been recovering from his own bout with strep) and was on 9D when the rains, macrobursts and tornadoes hit. The winds flattened trees around him and literally ripped through other trees. 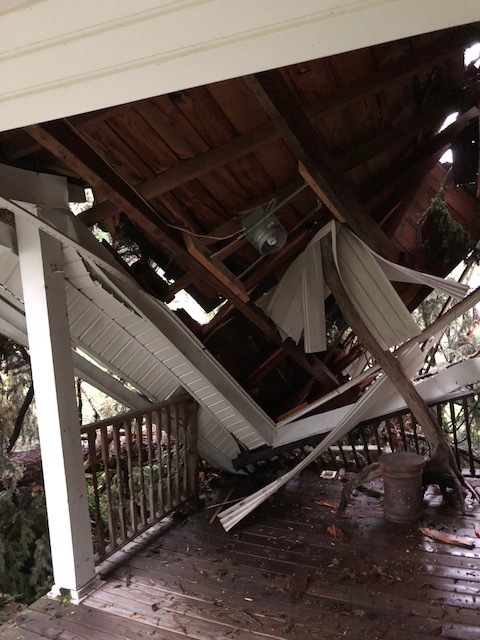 At least three fatalities were blamed on the winds, which brought trees down, right onto people in cars (see details in this Highlands Current article). 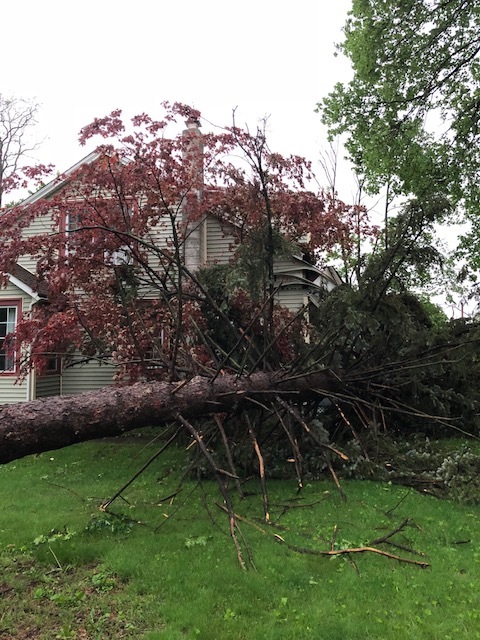 Three tornadoes went through Connecticut, and at least four hit New York (including one in Newburgh) bringing winds between 75 and 100 mph, spanning paths of several miles (see a photo here from Central Hudson). 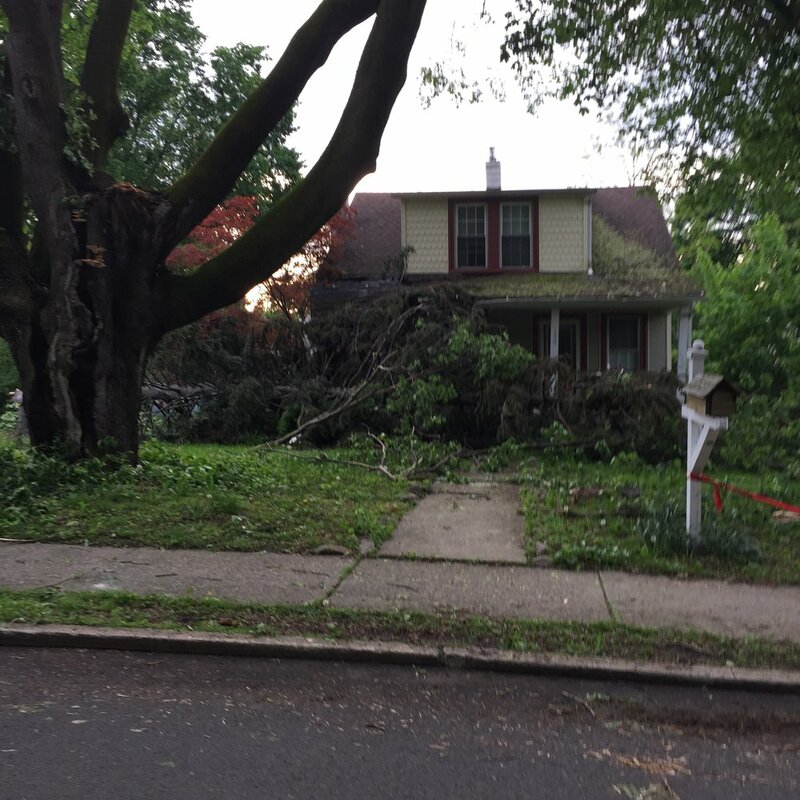 Some of the worst damage was caused by macrobursts that ripped through Dutchess County and other counties. Macrobursts possess wind speeds of 100 mph or more, and travel in straight lines for miles, unlike tornadoes, which have rotating, swirling, damaging winds. Central Hudson also confirmed that 1,000 lightning strikes happened per hour: “Storm with winds up to 78 MPH + 1,000 lightning strikes per hour has interrupted service to more than 72,000 customers.” Dutchess County Executive Marcus Molinaro declared a State of Emergency, and Governor Andrew Cuomo declared a State of Emergency and deployed 125 National Guard members to help with the storm's effects. On Wednesday, Central Hudson stated that many workers were on duty to clear trees (from street scenes like these) and restore power: “Approximately 185 line workers together with nearly 180 tree personnel are clearing roads and restoring power in our service territory today. Additionally, more than 270 mutual aid line workers are anticipated to arrive throughout the day.” See Central Hudson's trucks here restoring power. The Stony Kill wagon, a reliable sight on route 9D promoting the Open Barn, was turned over. Amazing that it did not get torn to smithereens! The wagon has since been righted back up. 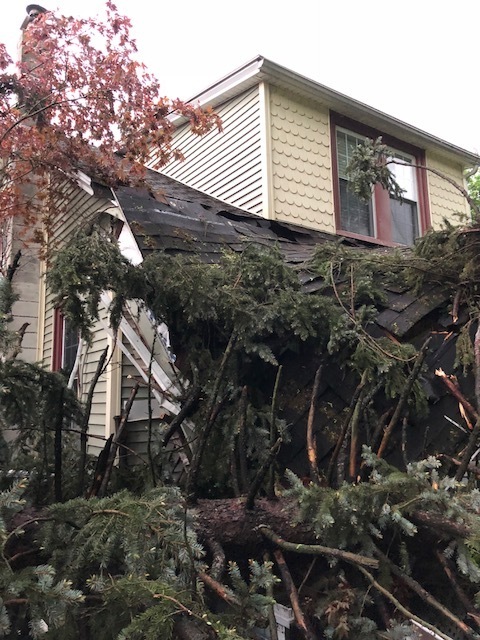 In Wallkill, my assistant was working on a project with me via email, and the next minute she was MIA, as the wind had ripped open a tree in her yard, and it tore apart a newly completed shed at her neighbor's house. Castle Point, which is located along the Hudson River just north of Beacon, is the home of many families as well as the VA Hudson Valley Health Care system. Macrobursts ripped through the area. My friend's wife works at the VA hospital, and he was waiting for her to come home, as it's a 10-minute drive. She did not get home for several hours, after being stuck in Castle Point as it dealt with trees and debris that had been tossed around by wind. Beacon school teacher Brian Antalek, who lives in Castle Point, was quoted in the Poughkeepsie Journal as having to park his car at neighboring Stony Kill Foundation and walk two miles to his home in Castle Point. One man who I encountered at the grocery store told me about the huge oak tree in his yard that blew into the next yard. Shingles and pieces of housing landed in his yard, and he could only surmise that they were from Newburgh, as they didn't match anything nearby. 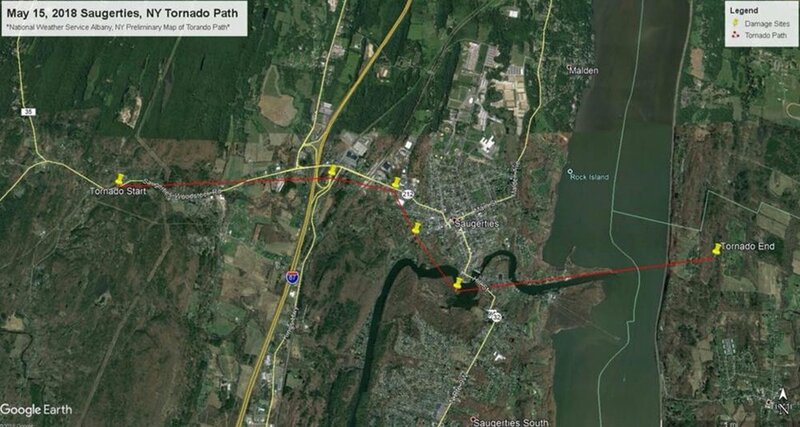 A map of a tornado path in Saugerties shows a tornado traveling across the Hudson River. Photo Credit: National Weather Service via Hudson Valley Weather. Newburgh received extensive damage, and is still recovering and still has areas without power. 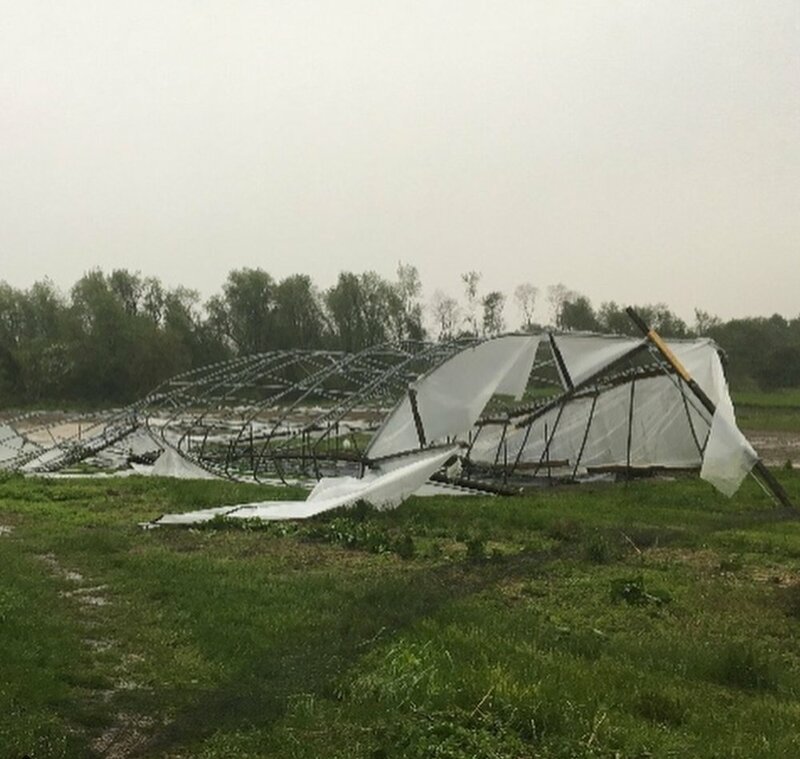 According to Eastern Dutchess Fire and Rescue: "Electrical substations which supplied power to the City of Newburgh sustained heavy damage requiring extensive repair. It is very possible that vast areas of the City may experience many days without electricity." Residents are boiling their water and those with gym memberships were using the facilities to shower. I got a call from a sales person living in Newburgh on Friday trying to set up a meeting, which she couldn't quite commit to, saying "I can't see anyone like this, I have to wait until the power comes back on." Stony Kill Farm and Common Ground Farm in Fishkill suffered many trees down. A fire erupted on 9D near the farm (in the picture below with red bathroom barn). A transformer had exploded and caught fire on 9D. Stacey from Stony Kill Foundation reports that all of the farm's animals were unharmed and OK.
We had been to Stony Kill and Common Ground a week prior, on school field trips to see Common Ground Farm's pride and glory, the thriving tomatoes under the tarp greenhouses they built - which were destroyed by the winds. An electrical fire blazing on 9D, in front of Stony Kill Farm. This view is of their bathroom facing 9D. The fire was not in any of Stony Kill's buildings and all of their farm animals are OK. The greenhouse that protects the fledgling tomatoes at Common Ground Farm. In Dutchess Junction, a tree fell on a power line. 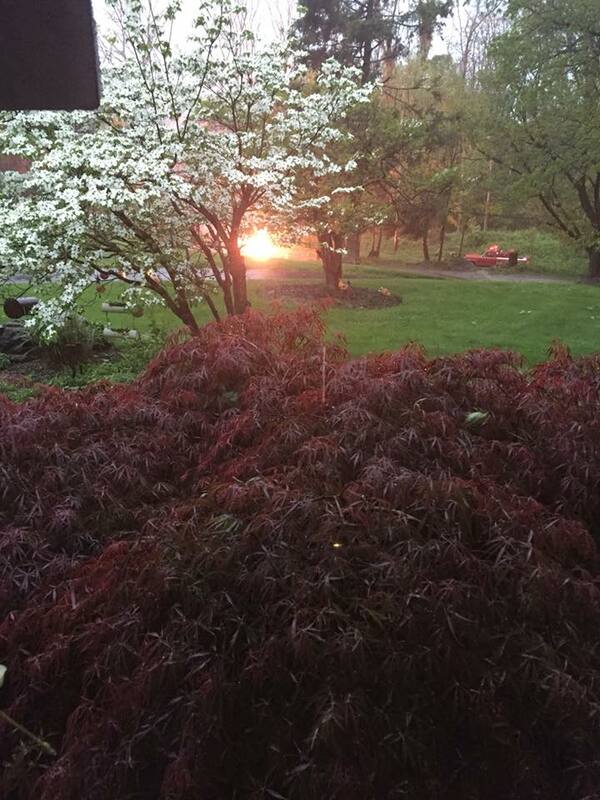 That caused an electrical fire for about 45 minutes until Central Hudson came and turned off the power, according to Maria Garcia Mojica, who submitted the picture below. An electrical fire in Dutchess Junction. The interior designer Ryan Samuelson experienced severe damage to his home on Washington Avenue in Beacon while he was in the basement. "I was just coincidentally down in the basement grabbing something. I didn’t even know about the storm warnings. Then I felt and heard a loud crunch and knew something pretty serious just happened." Ryan Samuelson's home on Washington Avenue in Beacon. In Fishkill, Route 52 was brought to a standstill, contributing to the traffic blockade that delayed people for hours trying to get into or out of Beacon. The CVS pictured below is the one on Route 52 near Love Nails. These photos were submitted by Kathy Harrison. Many construction projects are in progress here in Beacon. The most recent are those on 9D which cleared parcels of trees to prepare for the construction of new apartment buildings. One of two trees left on one property blew over (doesn't seem to be dead yet, however). Fencing blocking the other construction project blew away. 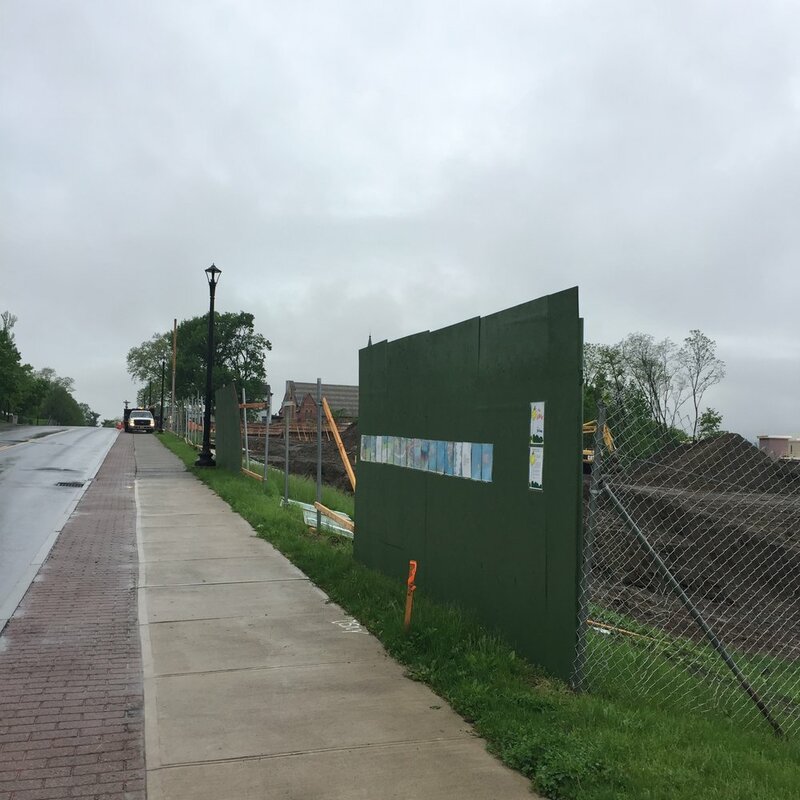 A reproduction of the children's book, The Lorax, which is about preserving trees, had been posted on the fence in a statement about the removal of the trees. That portion of the fence remained through the wind blast. The fencing destroyed in the storm has since been replaced. In Beacon, many trees came down. This yellow house on Verplanck is a known abandoned house, which is rumored to be lost in bank foreclosure paperwork. Just who will haul away this tree may not be straightforward. A tree blown down on Willow Street by the storm blocked this alternate backroads artery for two days after the storm. With 9D already limited by planned construction to finish NYSDOT ADA curb-cut ramps between Main Street and I-84, side streets like Willow, Orchard Place, Dutchess Terrace and others become back-road alternates. 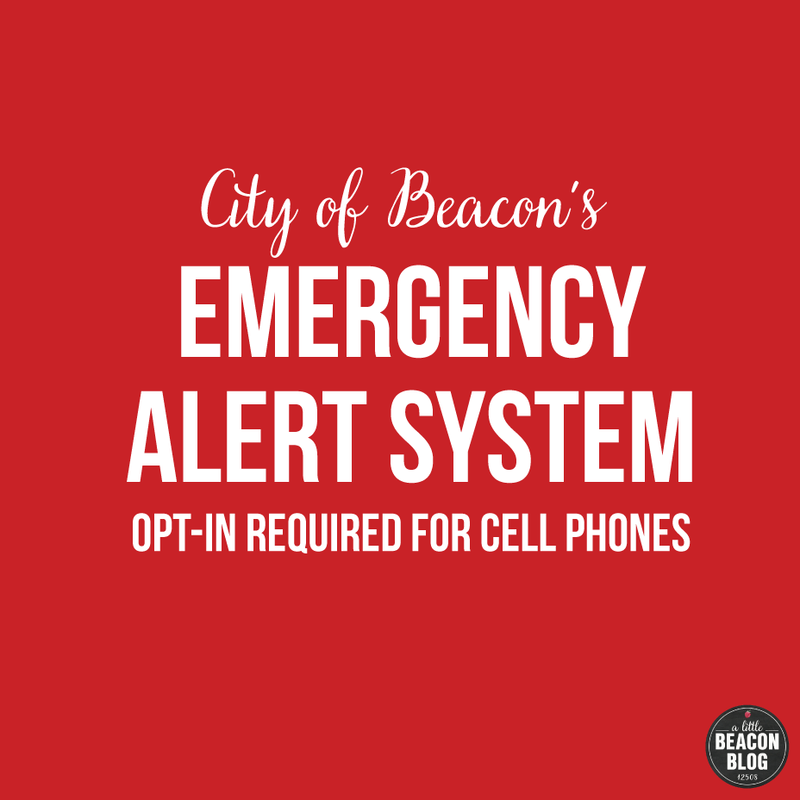 This made getting into or out of Beacon even more difficult. This tree below was cleared swiftly on Friday. This Tree, down and blocking Willow Street, was Cleared away two days after the storm. The macrobursts took out bits and pieces of structures in their path, making some of the destruction seem random. A brick wall and bush were taken out at this house on Rombout Avenue. A house on Rombout Avenue. The small Fanny Fay Girl Scout House, at the end of Rombout Avenue, is surrounded by trees. We headed over to check out if any had fallen. This one did, but fell away from the house, further into the woods. 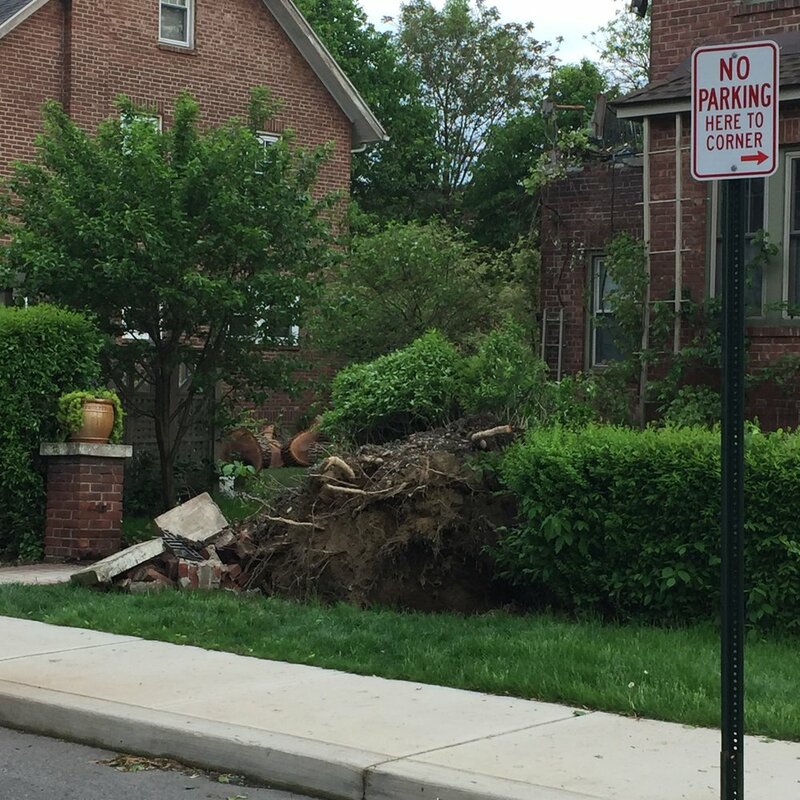 This Tree uprooted at the end of rombout avenue, at the Fanny Fay Girl Scout House. Please note that most businesses in Beacon are now open! Several opened soon after the storm. Some parts of Main Street were without power, while others retained it. 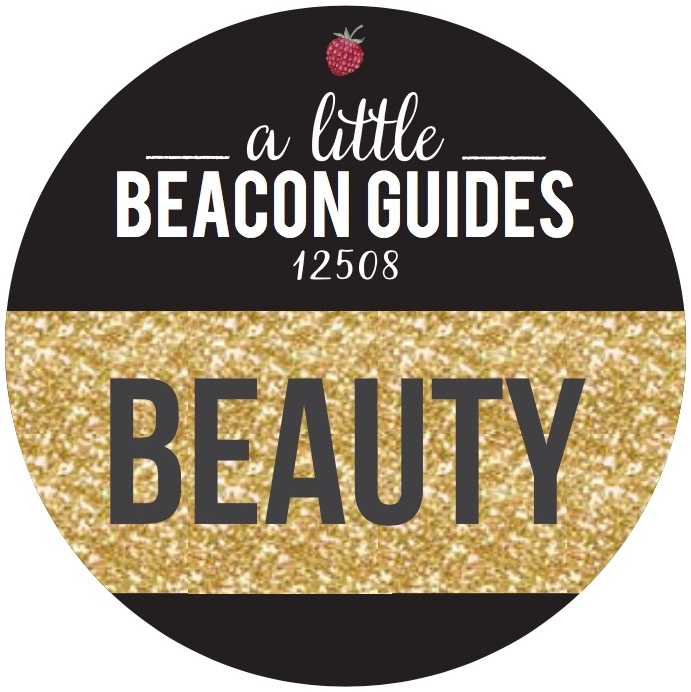 Main Street Beacon is back in business. While the macrobursts, with winds of 100 mph and higher, caused major widespread damage, here are some statistics on the recorded tornadoes. 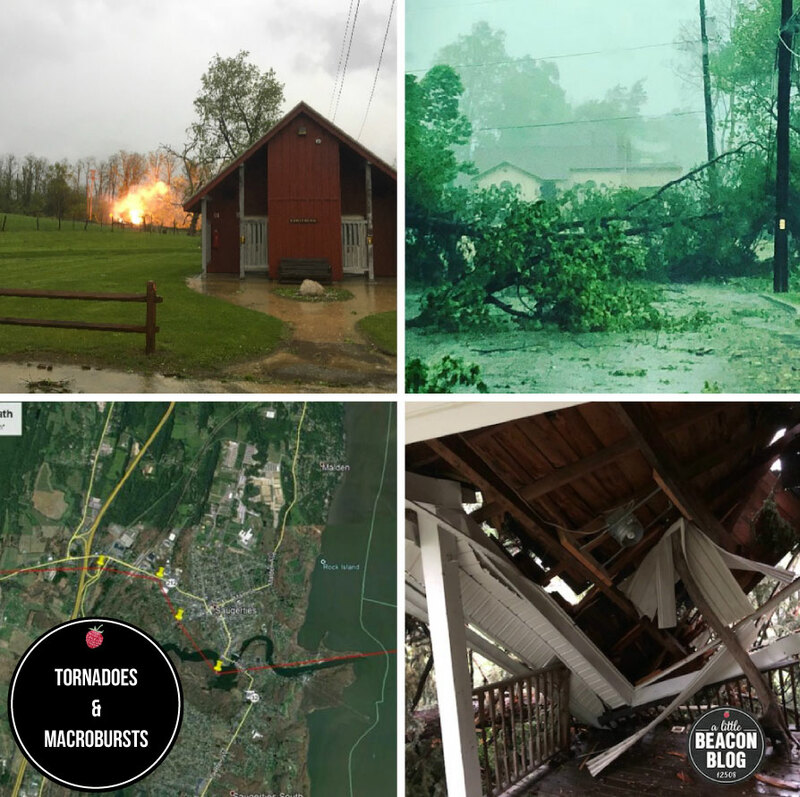 Location: The tornado path started along Route 212 between Woodstock and Saugerties and moved east through the western and southern part of Saugerties before crossing the Hudson River and ending in Tivoli, NY, just south of Clermont State Historic Site. Location: Originated near Albany Post Road, south of Bennett Road. The tornado lifted near the Hudson River behind Susan Drive. Location: Originated along Route 22 north of Haviland Hollow Road, lifting near the intersection of East Branch Road and Fairfield Drive. What was your story during the storm? Please share it in the comments below. A six-block radius of Newburgh has access to newly established capital through a program called the Creative Neighborhood Loan Fund, through the efforts of Hudson Valley Pattern for Progress and Rhinebeck Bank. According to a press release announcing the loan, Hudson Valley Pattern for Progress has launched an economic development plan with a goal of improving the business climate in an approximate six square block area within the City of Newburgh, near furniture maker and studio space rental initiative Atlas Industries, and SUNY Orange’s City of Newburgh campus. The zone roughly includes an area bordered on the north by Catherine Street and on the south by South William Street. To the west, it is bordered by South Johnston Street and to the east by River Road. See the full map here. Rhinebeck Bank is enhancing the efforts of Hudson Valley Pattern for Progress on this project by "allocating $3 million of our loan portfolio to fund secured-term loans including commercial express loans, equipment and vehicle purchases, leasehold improvements and real estate transactions under favorable pricing, advance rates and terms to the prospective borrowers in the Newburgh Creative Neighborhood," according to their website. A business who has already benefited from the Creative Neighborhood Loan Fund is one of Newburgh's newest businesses, Liberty Street Bistro. 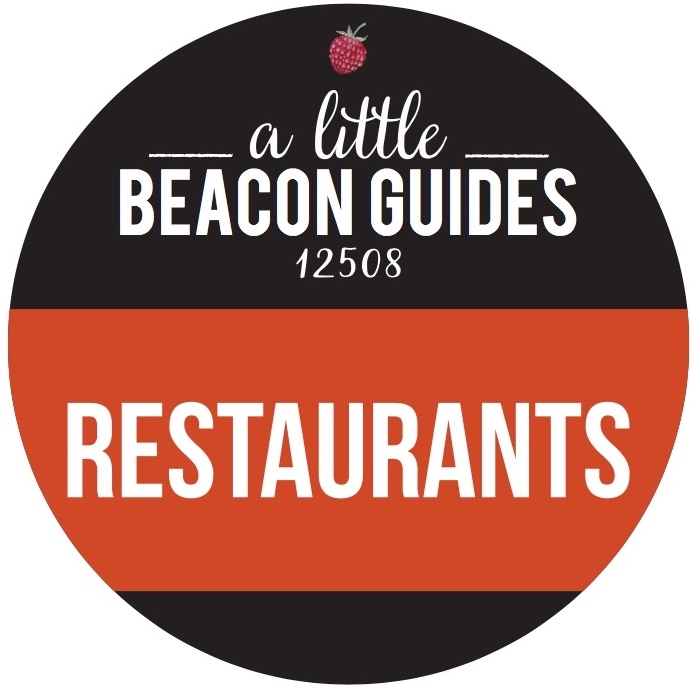 Owner and Chef Michael Kelly discusses it here with Michelle Barone-Lepore. For more information on applying for this loan, reach out to Hudson Valley Pattern for Progress, at rdegroat@pfprogress.org or call (845) 565-4900, or to Rhinebeck Bank's Richard J. Kolosky, Commercial Lending Director, Hudson Valley West, at rkolosky@rhinebeckbank.com or (845) 790-1538. Editorial Note: Rhinebeck Bank is a sponsor of A Little Beacon Blog, but this article is not related to their campaign. A Little Beacon Blog learned about the program and thought readers would like to know more about it, as more Beaconites look to Newburgh for business space innitiatives. Choice Films & Theatricals is currently seeking extras for the upcoming TV series production of BIG DOGS! All roles are paid, meals will be provided, and you will even get an IMDB credit! They are currently in production and will be shooting for the next four months in and around Newburgh and Manhattan. They are looking for many local people for immediate hire to appear as background in the series. There will be shooting in Beacon this Thursday and in Newburgh on Friday, so don't delay! Anyone interested in becoming an extra should email casting@choicefilms.com with a headshot (it does not have to be a professional headshot) and your contact information. Poster commemorating the 140th Flag Day on June 14, 1917. Photo Credit: Wikipedia Page for Flag Day. In New York State, the Second Sunday in June has strong patriotic significance: It is the state-recognized holiday of Flag Day. Locally, it is one of the most important days for the Elks Lodge, as one of its most famed members, Harry S. Truman, was the president when National Flag Day was established by an Act of Congress. The Elks Lodge at 900 Wolcott Ave. is commemorating the day by conducting the Elks Ritual on the history of the nation's flag. A coalition will be held immediately following the event. The Boy Scout Troop #41 and the Newburgh Free Academy high school Air Force ROTC will present the colors. The flag was initially adopted on June 14, 1777, by a resolution of the Second Continental Congress. Woodrow Wilson issued a proclamation that officially established June 14 as Flag Day, followed by the Act of Congress during Truman's presidency. While the day is not a federal holiday, New York State did designate it as a state holiday to be recognized on the Second Sunday of June. Carl Oken, District Deputy Grand Exalted Ruler of the Mid Hudson Elks Club, is looking forward to the event and says: "It's an event you should not miss, and is a great education for our children." Grab your library card and rev up those engines! The Howland Public Library has announced that patrons can now visit the Motorcyclopedia Museum in Newburgh for free when you check out the museum pass at the library. The museum, which opened in 2011, includes 85,000 square feet of exhibit space with more than 500 motorcycles, dating from 1897 to the present. Exhibits also include photographs, posters, memorabilia, machinery and all things related to bikes. 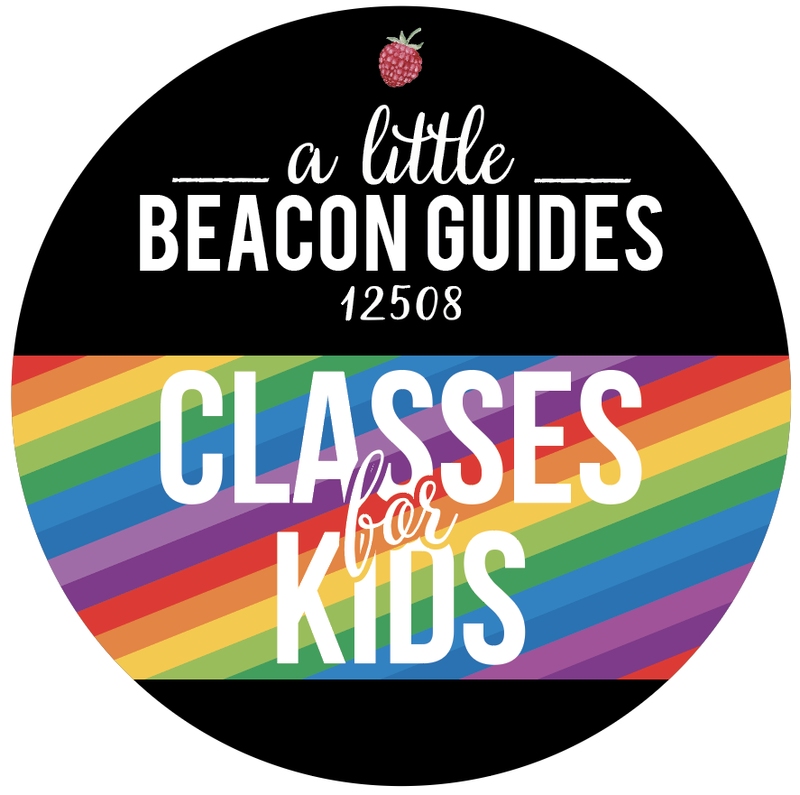 The pass can be checked out by an adult (18 or older) in possession of a library card in good standing with Beacon as the home library. The pass must be returned to the Howland Public Library’s front desk before closing time on the same day it was checked out. If borrowed on Saturday or Sunday, the pass may be returned the following day. Exhibit of the Newburgh-Beacon Ferry Now Open - But First, Did You Take the Ferry Yet? Many locals are likely aware of the cute blue and white ferry that chugs back and forth between Beacon and Newburgh multiple times each weekday. It's the official Newburgh-Beacon Ferry that roared back to life in 2005 after being taken out of the water when the Newburgh-Beacon bridge was built, and it is in the spotlight right now at the Newburgh Historical Society, who has the ferry's history on display at their headquarters at The Crawford House. Most of the ferry riders are commuters from the west side of the Hudson River who have opted out of driving to New York City. Instead of driving over the bridge and trying to snag a coveted parking spot at the Beacon Metro-North train station, they hop on the ferry and arrive on the Beacon side, just steps from the local and express trains that will whisk them into New York City for work. Still, savvy adventure-seekers are also discovering that the quick river jaunt (it’s about six to eight minutes) makes for a fun and affordable outing. Whether it’s a romantic rendezvous, capped off with cocktails on the Newburgh waterfront, or just a breezy boat ride with the kids, taking the ferry is a cool way to explore the region. The boarding dock on the Newburgh side. A one-way fare for an adult is an easy $1.75, and kids under 5 ride for free. Children ages 6 to 11 as well as seniors 62 and older are only $1. The last trip from Newburgh to Beacon is around 8:20pm (always check the train schedule), so plan for an early night if hitting the Newburgh waterfront. A ferrygoer, verifying the last ferry time, making sure to not miss the boat. The current ferry began service in October 2005, mainly to deal with the overcrowding at the Beacon train station parking lot. But the Newburgh-Beacon ferry actually has a long and storied history as one of the first, and longest-lasting, ferry routes in the country. First established with a charter from King George II in 1743, ferry service continued for 220 years until 1963, when the completion of the Newburgh-Beacon bridge made the ferry obsolete. ... Or so people thought. Now, the new exhibit at the Crawford House Historical Museum in Newburgh uses photos, paintings, documents, videos, and other memorabilia to bring to life the story of the ferries that were such an integral part of transforming both Newburgh and Beacon into bustling industrial hubs. The one-room exhibit, which is jointly sponsored by the Historical Society of the Newburgh Bay and the Highlands as well as the Beacon Historical Society, covers a lot of ground. It begins with the early days when the first ferries were powered by oars and then horses. Even George Washington and his troops rode the ferries frequently during the War of Independence! But the bulk of the exhibit focuses on the early part of the 20th century, with intriguing photos of the three main ferry boats of this era: the Orange, the Dutchess, and the Beacon, all of which could carry up to 30 cars (the current ferry only transports people). By the early part of the 20th century, both Newburgh and Beacon had bustling waterfronts. Situated halfway between New York City and Albany, Newburgh was a transportation hub on the river and had dozens of waterside factories producing everything from bricks to lawnmowers to ships. Both the Dutchess and the Orange were built in a Newburgh shipyard. Workers crisscrossed the river via the ferries constantly — either to work in Newburgh or in one of the many Beacon factories that produced hats, bricks, and other wares. The ferry was also a popular river crossing for travelers in the Northeast, as well a social outlet for people of all ages. “Teenagers, families, everybody loved to ride the ferry,” says McTamaney. The boarding dock today near Long Dock on the Beacon side. The rose-lined walking path to the boarding dock on the Newburgh side. Several photos and newspaper articles highlight the historic last day of ferry service: November 3, 1963 — one day after the opening of the Newburgh-Beacon bridge. The Dutchess and the Orange famously saluted each other mid-river on their final run. Captain William Atkins had been a ferry pilot for 41 years and recalls his last trip: “Twenty cars and a handful of passengers, many intent only on getting to Beacon, rode the Dutchess. The ferry’s smoke blew toward the Dutchess County shore. The slip rumbled as the engines started and the boat’s whistle sent up a forlorn goodbye to Newburgh.” The closure of the ferry is reminiscent of how The Little Red Lighthouse felt when the bridge got built above it, but this fear of becoming obsolete became a reality for decades. The resurgence of the ferry since 2005 has corrected that, thanks to the demand from commuters, and perhaps now people seeking an easier way to get to Newburgh than by car. Who knows, maybe with enough requests it will open on the weekend, or even return to running 24 hours a day! In addition to the exhibit, the Crawford House itself is a must-see. This grand 1830 Neoclassical home simply oozes with historic (albeit musty) charm, featuring stunning river views and an impressive collection of Hudson River School paintings. It was built for Captain David Crawford, a maritime entrepreneur, who played a key role in turning Newburgh into a major shipping and industrial city. Architectural highlights include 40-foot iconic columns, front and rear Palladian windows, and exquisite woodcarvings throughout. In 1958, the Historical Society of Newburgh Bay and the Highlands purchased the house to prevent its demolition for a planned parking lot. One kink in the perfect planning of going to the ferry exhibit: Visitors cannot take the ferry itself there, as the ferry only runs on weekdays, and this exhibit is open on Sundays from 1 to 4pm until December 31, 2016. Olivia Abel is a longtime magazine editor and writer. Most recently, she spent a decade as the Editor in Chief of Hudson Valley Magazine, but she’s also written for People, The New York Times and many other publications. Olivia loves living in a town that has its very own eponymous mountain and although she never lived up to her public claim that she would climb said mountain every morning before work, she still loves exploring from one side of Beacon to the other. She is obsessed with local history and we’re happy that she’s hung up her editor’s hat (for now) and is writing for us.